How much does it cost to travel to Killarney? How much money will you need in Killarney? The average price of a hotel for a couple is €58 ($65). Additional pricing is in the table below. These average travel prices have been collected from other travelers to help you plan your own travel budget. Rated by TripAdvisor as Ireland's most popular travel destination for 2015, Killarney attracts many visitors each year for its natural heritage, history, and its location on the Ring of Kerry (a 179-km-long circular tourist route in County Kerry, south-western Ireland). Dating back to early Irish history with religious settlements, Killarney's rich history lays evident in the ruins of various abbeys, monasteries, and castles. The archaeological sites are popular with tourists as well as the town's natural wonders, gift shops, pubs, and horse-drawn carriages. As far as the natural wonders go, Killarney National Park has much to offer in that and more. It is located just beside Killarney, encompassing 25,425 acres of diverse ecology, including the Lakes of Killarney, oak and yew woodlands, and mountain peaks. It has Ireland's only native herd of red deer, as well as many other rare species, and the most extensive covering of native forest remaining in Ireland. It is also home to the ruins of Innisfallen Abbey, one of the most impressive archaeological remains dating from the early Christian period. The Gap of Dunloe is yet another gem of natural beautya narrow mountain pass between MacGillycuddy's Reeks and Purple Mountain. Within the gap are five lakes: Coosaun Lough, Black Lake, Cushnavally Lake, Auger Lake, and Black Loughall connected by the River Loe. The narrow pass is a popular destination for tourists to see by cart and ponies, and is also known for its rock climbing. 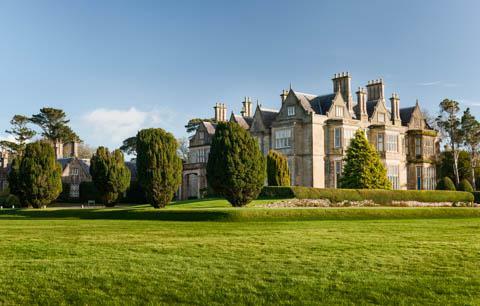 On the other end of the spectrum, Muckross House and Gardens is a furnished 19th-century mansion set among mountains and woodland, with a shop, café, and working farms. It is located at the center of Killarney National Park, and the grounds and house are open to visitors for a fee. The mansion sits above one of the park's lakes as an example of Victorian grandeur. The house hosts regular events for all seasons. Muckross Abbey is another historic structure located nearby. It was founded in 1448 as a Franciscan friary for the Observantine Franciscans by Donal McCarthy Mor, and still stands preserved today. The largest industry of Killarney is, by far, tourism, and so the town caters to visitors in shops, pubs, places to stay, and attractions. With the exception of Dublin, there are more hotel beds in Killarney than in any other Irish town or city. Most tourists come from the US, Ireland, the UK, Germany and other European countries, and the summer season is the busiest. The town center is quaint and welcoming, lined with small shops, pubs, and inns. It is also common to see horse-drawn carriages, called jaunting cars, catering to tourists. Killarney is also home to Ireland's National Events Center which seats 2,500 and host events and concerts throughout the year, adding to the town's lively night life. In addition to the sights and natural wonders mentioned above, Killarney holds a list of many more striking landscapes. The Kerry Way, for example, is a 133-mile long circular walking trail that begins and ends in Killarney. It is said to take about 9 days and brings visitors past Muckross House, along lake shores, to reach Torc Waterfall, and continue through Black Valley and Macgillycuddy's Reeks, including Carrauntoohil, Ireland's highest mountain. The trail follows past more scenic vistas and sweeping valleys, providing a whirlwind tour for the adventurer looking to experience the beautiful Irish countryside on foot. Then are plenty of other trails from beginner to expert, but if you are more of a water tourist, kayak and canoe rentals are available to use on any of Killarney's famous lakes. Back in Killarney itself, the town has plenty of shopping for your Irish goods and souvenirs, plus some of the best nightlife around. The pubs come alive with great brews and entertainment thriving on live traditional music. You might even want to check if Ireland's National Events Centre has any upcoming concerts. Past artists have included Willie Nelson, Cliff Richard, The Script, Snow Patrol, Bob Geldof, Billy Connolly, Kenny Rogers, and José Carreras. When it comes to Irelandpubs, brews, and comfort food are specialties wherever you go. Some of the top pubs in Killarney, most featuring live Irish music, include places like Murphy's Bar, The Laurel Pub, and The Jarvey's Rest Traditional Irish Pub. There are also trendier takes on the traditional with a Celtic Deco hangout like Bricin. Situated in a tastefully restored two century old restaurant on Killarney's high street, the place embodies Irish hospitality with natural stone walls, the warmth of antique timber, and the magic of stained glass. Other top picks on TripAdvisor include Hannigan's Bar and Restaurant, Cronins Restaurant, and Quinlans Seafood Bar. Most dining options are located on around Main Street in the downtown area of Killarney. Far from the traditional fish and chips, bangers and mash, or shepherd's pie, ethnic cuisine like Indian and Thai can also be found in Killarney. By car, Killarney is served by National Primary Route N22 (north to Tralee and Castleisland and east to Cork), the National Secondary Routes N72 (west to Killorglin), and the N71 (south to Bantry). By train, Killarney railway station (operated by Iarnród Éireann) has direct services to Tralee, Cork and Dublin, with connections to the rest of the rail network. Bus Eireann provides bus services to Limerick (and onwards to Dublin), Tralee, Cork, Kenmare and Skibbereen. The nearest airport is Kerry Airport, located 17 km away in Farranfore between Tralee and Killarney. It provides an increasing number of air services with connecting trains running from Farranfore railway station to Killarney railway station. Cork Airport (89 km away), which is easily accessible by bus or rail, also serves the Kerry region. Traveling alone to Dublin or London? Looking for a party and need a hostel in London or Amsterdam?